ORIGINAL ISLAND BEACHFRONT LlVING. Cayman Kai. 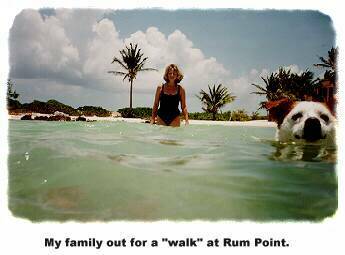 Rum Point. Set on a beautiful sandy beach, protected by reef 150 yards offshore. Secluded...far from the hustle and bustle of Seven Mile Beach. This is the place to "decompress". Sorry, no TV! Step out the back door to swim, snorkel, and scuba dive, in perfectly calm clear warm Caribbean water, take an endless walk on a timeless beach; or sunbathe, read a book, and sip a pine colata from the blender. 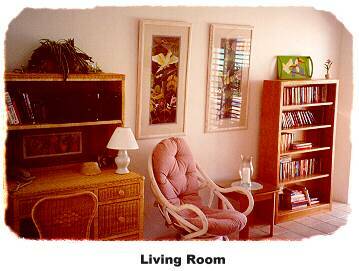 Living room and bedroom open to a screened porch looking out to the sea. Original Island Beachfront Living is simple, yet elegant. Open architecture allows the tradewinds to naturally cool each room. Sloped roofs collect precious rainwater for the cisterns. The hammock becomes a favorite place to nap. Dining is often on screened porches with pleasant conversation under starfilled nights. Time slows. You get in touch with what is important. A new perspective awaits. 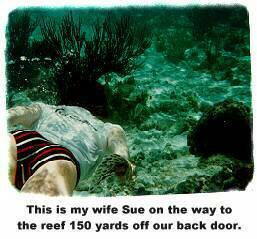 Easy access to North Wall diving and Stingray City. Minutes from Red Sail Sports, elegant dining at the Rum Point Club and The Kaibo Yacht Club, or a lost afternoon at The Wreck beach bar. Red Sail offers many watersport services as well as a beautiful 40 minute ferryboat ride to the Hyatt Britannica golf course on Seven Mile Beach. 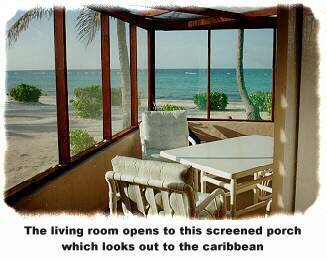 Other Information about the sleeping facilities: Bedroom opens to screened porch (photo) looking out to Caribbean. 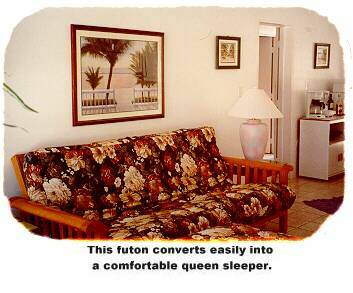 Futon in living room easily converts to comfortable queen sleeper- click here for a photo. Crib available on request. Other Information about the kitchen/dining facilities: Kitchen cabinets, cooking ware, flatware, and all appliances including blender are new as of 12/98. Hi-chair available on request. 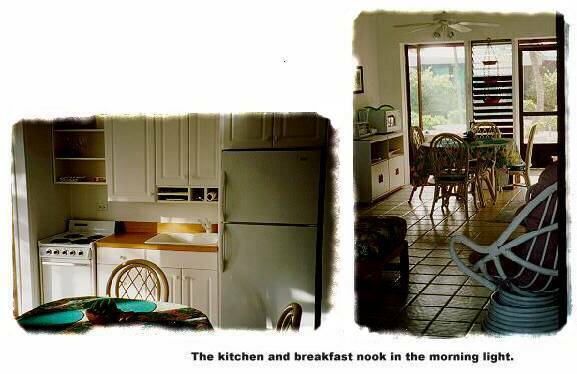 Photo of the kitchen and breakfast nook. Other information about the other living space: Open air. Views of the Caribbean. Overhead fans in all rooms. Dramatic ceilings. Freshly painted white walls and ceilings. Other amenities not listed above: 150 book library, Hammock Beach towels, optional maid service, optional grocery shopping service, games for adults. Other activities/entertainment: Two challenging golf courses just 40 minutes away, Boats to Sting Ray City, The North Wall and other sites for Scuba divers, snorklers and their families 3 minutes away. Atlantis Submarine 45 minutes away. Romantic moonlight cruises 3 minutes away. This one bedroom condo is freshly painted in white and decorated tropically. It has overhead fans in each room. 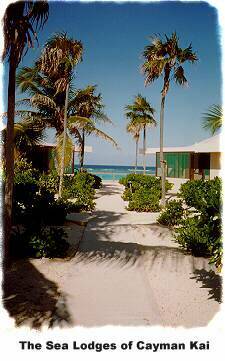 It is located right on the sandy Caribbean beach in Rum Point. Rates are for 1-2 persons. Additional guests are $15/night; $10/night in summer. 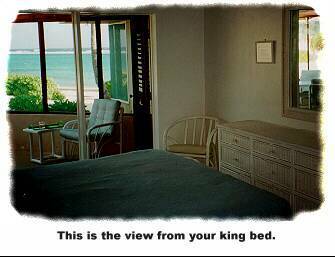 Rates quoted do not include 10% Cayman Accomodations tax. 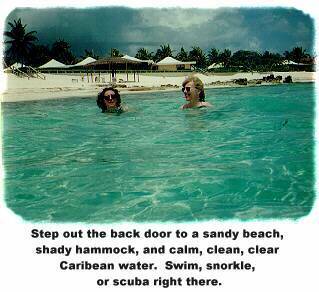 a month in the tropical Caribbean. Only $2100 for two! Pick your 28 days between July 23 and September 4, 2002.